Facebook is one the best social networking site with millions of active users. Almost all of your friends and family members might be on Facebook. Right? After all, it's very important to be online in today's world so as to maintain balance between your personal, social and business life. According to Facebook News Room stat report, there are around 989 million mobile daily active users on average for March 2016. Most percent of these people use Facebook from its official app. You may be one of them. To provide friendly environment, fastest speed and better user experience, Facebook provide separate apps for different type of users. For example, those who have low 2G internet connection can use Lite app. On the other hand, normal users having good Wi-Fi connection can use default Facebook app to get most out of user experience. If you've a verified page/profile, it's good to use Mentions app which is especially designed for verified users to provide advanced features like live videos and last but not least, if you want to chat with someone, you can use Messenger app. No matter, how many apps Facebook have but they all have few things in common. All of them use unnecessary mobile data, they're very slow to load (except Lite app, which we'll discuss later) and they eat unnecessary phone memory space. 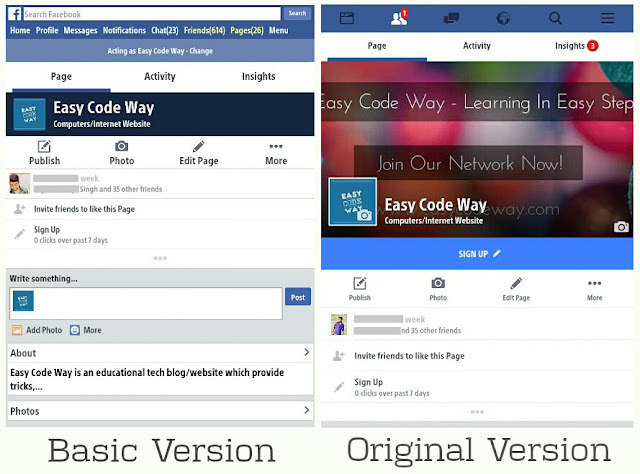 As like apps, there are number of site versions of Facebook. UC browser use the basic version which is light-weight and very fast to load. The user interface (UI) of Facebook site in UC browser is so old-fashioned that it looks like you're using a 90's website. But on the other hand, there are number of positive benefits. Below I had compared both default and basic site versions. Obviously, the basic version provide better user experience as it's light-weight, fast and use less mobile data usage. However, you can switch between these two site versions any time. UC has added a new add-on (or extension) which let you turn on or off the basic version of Facebook manually. To use it, first open UC browser and click the menu button (three parallel lines at the bottom of the screen). Now click "Add-ons" option here and find "Facebook". If it's not there, you can add it by clicking "+" button. Under this add-on, switch on the button next to "Browse Facebook Faster" option and it will automatically enable the basic version. Undoubtedly, UC is the fastest Android web browser. Its surfing speed is like Google Chrome and downloading speed is no less than IDM. This is the reason why I use it for Facebook. The basic site version is very fast to load in UC browser. Even in low 2G internet connection, it works perfectly. Another reason is low quality images. Before downloading, UC browser compress images on its server as like Google's Weblight feature do. You can also change the quality of images manually. To do this, again open UC browser and click menu button. Now scroll to left and go to "Settings > Browsing Settings". Here tap "Image quality" option and choose the quality as per your own choice. Note: If you don't want to download images, you can use text-only format. This can be helpful when you're reading something or chatting with someone so as to reduce your data usage and to boost up the surfing speed. After a long use, a lot of cached data is saved in RAM memory. Each app needs its own space to work and if there will be no space, your phone will start hanging. 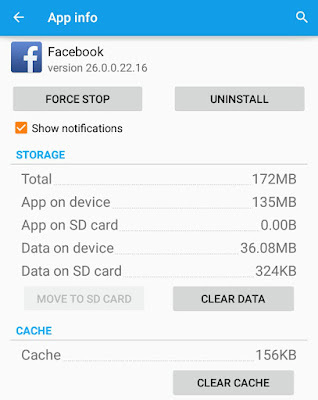 The default Facebook app size is more than 100MB. As you can see in below picture, the total storage of this app is around 170MB including its saved data and cache. To overcome this memory problem, Facebook has developed a new app named as "Lite", which is less than 1MB in size and especially designed to improve user experience. Apart from this, UC browser is another alternative to the default Facebook app to save your phone memory. Its app size is around 50MB which is very less. Moreover, it saves very few cache and it can be used in two ways, as a normal browser and to use Facebook. One side you're using Facebook basic version and also you've reduced images quality. On the other hand, you're using Facebook in its app or in other browser (such as Chrome). Tell me which one will use less mobile data? Of course, first one and that's why UC browser is best for Facebook. As like other apps, UC browser also allow push notifications. Each time when you'll get new notification, UC browser will automatically push it in your phone's notification tab even when you're not using it. 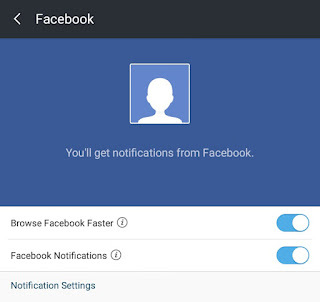 Good thing is that, you can enable or disable these Facebook push notifications manually any time. To do this, again go back to the UC add-ons tab and open Facebook. In the following page, switch on the "Facebook notifications" button. Make sure that you're connected to the Internet. 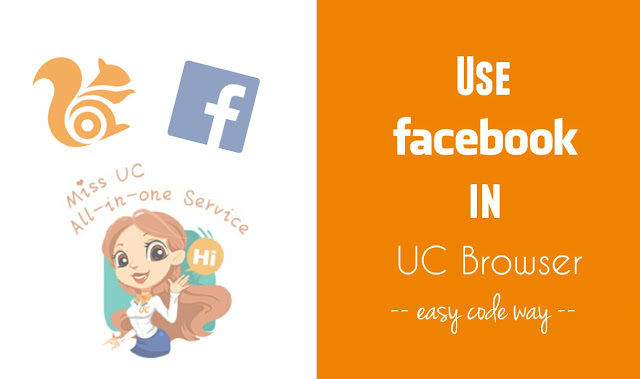 These are some of the benefits of using Facebook in UC browser. So what are you're waiting for? First delete all other apps from your phone and then install UC browser from Google Play. What do you think about this topic?